King Olav V of Norway past quietly away at 22.20 CET in Oslo on January 17. 1991. With this the Norwegian said goodbye to one of the Worlds finest sovereigns. Olav V was born Alexander Edward Christian Frederik on July 2. 1903, time 17.50 GMT at Appleton House in Sandringham, England. Two years later his father, the Danish Prince Carl was elected to the Norwegian throne, which regained its independence from Sweden (11.00 LMT, Oslo, June 6. 1905). Prince Carl took the Norwegian name Haakon VII and prince Alexander became Crown Prince Olav. King Olav V is closely related to the British Royal Family. His mother, Queen Maud of Norway, was the daughter of King Edward VII. Throughout his years Olav V performed the Royal task with inexhaustable energy, enthusiasm and dedication towards country and people. His ability to preserve royal dignity and at the same time regard himself as equal to his subjects put him in a class of his own. During the oil crises of 1973 the King used public transport to reach his favourite skitrack. He sat next to other passangers, skies beside him, and paid his fair from his own hand and pocket. Some times the King would be met walking his dog, Troll, along the landly paths outside his residence at Bygdoy. I believe this closeness between King and people is partly signified by the Sun in Gemini and Moon in Leo in the national chart of Norway. There is a story of a young soldior who, serving his compulsory military service, used to ride his bike through the parks of Bygdoy to reach to duty. Quite unexpectedly he met the King who was out alone walking his dog. "Down, Boy!" the King ordered the dog. But the suprise of meeting the king and receiving such an immediate order caused such confusion to the soldior that he lost control of his bike and ended up in the ditch! King Olav was always a cheerful person, a forefigure and grandfather to us all. He showed a sincere interest for the activities and welfare of his people. He was fluent in any topic and often engaged himself as a moral guide in affairs of current difficulty. The King was open about his own personal handicap, dyslexia, which was a radical confession at the time and offered both support and comfort to the personal struggle of all. Olav V has not only highest commanding in the Army but also leader of the Church. The King had always been an active sportsman and many people have met him on skis in those Norwegian woods that neighbour to the capital, Oslo. In his younger days he also did some skijumping. But most recognized wass his love for the sea and sailing. In 1971 he won an Olympic gold medal in the 5,5m class for yachts and a bronze medal in the world championships of 1976. Kong Olav was always present at the larger annual wintersport events, those of Holmenkollen, to mention some. A recollection of Olav V would not be complete without mentioning his strong love and devotion to his wife, Crown Princess Martha. They married on March 21. 1929. Sadly, Crown Princess Martha passed away far too soon, in 1954, by the cause of cancer. Olav V succeeded to the throne upon the death of his father, Haakon VII, at 04.35 LMT on Sept. 21. 1957. On March 22. 1990 I wrote a letter to the son of Olav V, Crown Prince Harald, advising him of directions within his own nativity. These would occur in June of that year and could cause him to succeed his father and enter the position as King within the near future. This, I suggested, could occur by natural means, i.e. the King wishing to abdicate due to His respectable age. But if this was not an intended plan, I advised, that the coming months would be an appropriate time to off-load His Majesty and support up around His good health and well-being. On May 29. 1990 the King was suddenly taken ill when an inflamation of the heartbag was discovered. On the evening of June 2. he suffered a strok which left him lame of the left side of his body, but from which he rapidly recovered. Since the end of May that year, the Crown Prince, now Harald V, acted in the capacity of regent. For this prediction I used Harald's birth chart and applied the Age Point Technique, directing the ascendant clockwise at a rate of 6 degrees per year. In June of 1990 Harald's age point was directed to the sign of Leo, which activated his natal Sun on the cusp of the Midheaven. 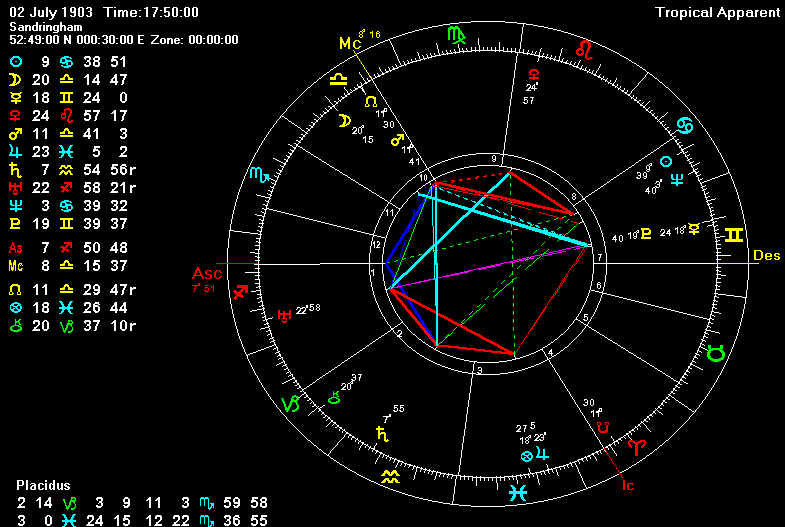 At the time of the death of Olav V, Mars, at 29TA21, was completing a transit of the national MC at 28TA13. From this I had predicted that damage would be caused to a mark of national identity. The Solar ingress to Capricorn showed the Moon on the cusp of the 4rth house squaring Mars, the significator of Norway, in Taurus on the cusp of the 8th, which focused on death and affairs of the grave. Another tremendous national capacity, the author Thorbjorn Egner, passed away on Dec. 23. 1990. Prior to the death of King Olav V the Solar eclipse of Jan 16. 1991 occured in the immediate north. This coincided with outbreak of war in the persian-gulf, a matter which caused his upset and sincere concern. A startling observation may be made in the death charts of both King Haakon VII and Olav V. These show the dispositor of the Moon's north node to be entering into the heart of the Sun. The north node represents the collective jointness and karmic growth or spiritual upliftment. The dispositor entering into the heart of the Sun seems to mean nothing but reunion with the Creator. King Olav V was a giant king in a small country and Nowegians thank God for what he had to give.